With this network management app available for both iOS and Android devices, you can take advantage of a variety of features including one-touch setup, one-touch monitoring, and one-touch management. In addition to managing this Smart Cloud Switch, you can also manage multiple wireless access points, switches, and network storage devices both locally and remotely. 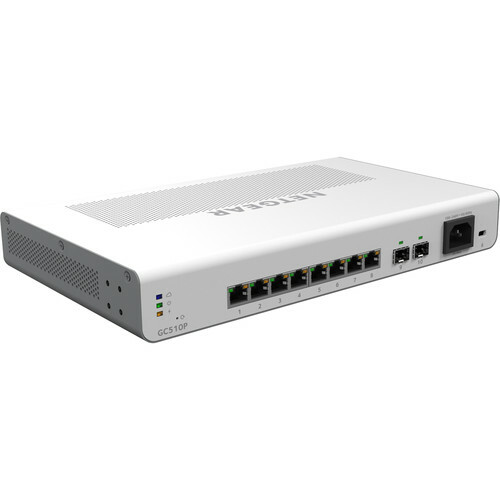 This Insight 8-Port Smart Cloud Switch features a 134W PoE power budget and comes equipped with eight Gigabit copper PoE+ compatible ports and two dedicated SFP ports. The 802.3at PoE-compliant ports make it easy to power a variety PoE-compatible devices such as access points, IP phones, and more. Once installed, the switch features 20 Gbps full-duplex bandwidth, a 1.5 MB buffer size, a 16K MAC address table, and support for up to 256 VLANs. Box Dimensions (LxWxH) 17.7 x 10.1 x 3.4"